This tutorial will introduce the method for PC users on how to extend or resize disk partition on Windows Server 2003 easily, safely and efficiently. Download IM-Magic Partition Resizer Server to safely and effectively extend system partition or data partition on Windows Server 2003 operating system. Once a hard disk has been divided into several partitions on your computer, you need to repartition the disk if you want to resize the disk partitions. However, repartitioning a hard disk will erase all data stored on the disk. If there is no other hard disk or external hard disk to backup the disk data, you may rely on third-party partition software to resize the disk partition. IM-Magic Partition Resizer Server is able to resize disk partition without touching data stored on the disk, so you don’t need to backup any data. How to Extend Disk Partition Server 2003? Download and install IM-Magic Partition Resizer Server on computer. Run the software and choose a partition that has lots of free disk space. Then right click the partition and choose "Resize/Move" option. You may move the arrow rightward or leftward to shrink the selected partition, and then you can see free disk space. The free disk space will be shown as unallocated volume. You need to move the unallocated volume close to the partition you want to extend. 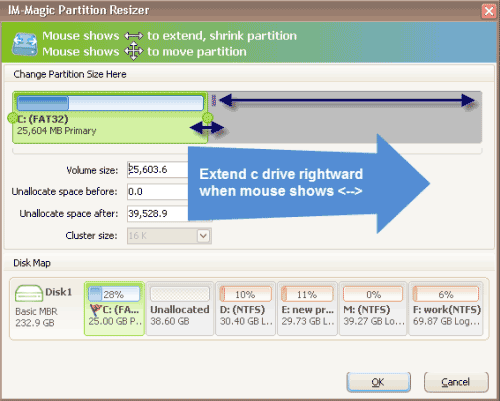 Then right click the partition you want to extend and choose "Resize/Move" option. Move the arrow to extend the selected partition and then click "Apply" button. For users who have never run into low disk space issue on system partition, probably they don’t know the meaning of such kind of warning message. When you receive the low disk space alert on system partition frequently, Windows is telling you that it is necessary to free more disk space on the drive now. Otherwise, it may cause terrible disaster to your computer. The most efficient way to solve low disk space issue on system partition on Windows Server 2003 is to extend the system partition by using IM-Magic Partition Resizer Server. You can increase the size of system partition as you like since the partition software is able to resize (extend, shrink) and move disk partition on all kinds of hard disks. Resizing a partition include extending partition and shrinking partition. When you want to extend a disk partition, free disk space is needed on the same hard disk. If there is no free disk space, you will need to shrink another partition that has enough free disk space. Therefore, you may often need to shrink a partition firstly before you can extend the partition which is running out of disk space. IM-Magic Partition Resizer Server supports you to extend or shrink disk partition without repartitioning the hard disk or losing any data. The free space squeezed by shrinking a partition will be shown as an unallocated volume. You often need to move the unallocated volume close to the partition you want to extend if you want to add the free space to the partition. For example, you shrink E drive to produce some free space, and the free space will be located close to the E drive. 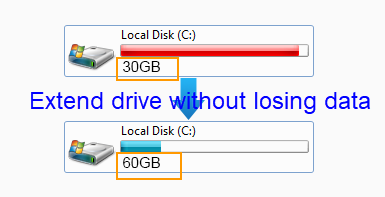 If you want to add the free space to C drive, you need to move the free space close to the C drive. On Windows Server 2003, you cannot move disk partition with Windows built-in tool. IM-Magic Partition Resizer Server enables you to move free space close to any partition you like so that you can extend the partition. Windows Server 2003 OS has a Windows built-in Diskpart tool, with which its users can extend disk partition. However, Diskpart command can only help users extend NTFS disk partition. However, IM-Partition IM-Magic Partition Resizer Server allows you to resize both NTFS and FAT32 partition. You don’t need to repartition hard disk, so no data will get lost from the hard disk after resizing disk partition. Whether you resize a system partition or data partition, IM-Magic Partition Resizer Server enables you to resize disk partition without reformatting. By using IM-Magic Partition Resizer, you can also create a new partition on Windows Server 2003. After shrinking a partition, the free space will be shown as unallocated volume. You can go to "Disk Management" to assign a drive letter to the unallocated volume and then format the volume. When the formatting is completed, the unallocated volume will be shown as a local disk under "My Computer". If you want to perform VMware extend C drive on Windows 2003, you can also use this free partition software.